While going through the basics, pasta is an inevitably part of it. This wonderful creation, made from only flour, eggs and/ or water is used for thousands of different dishes. 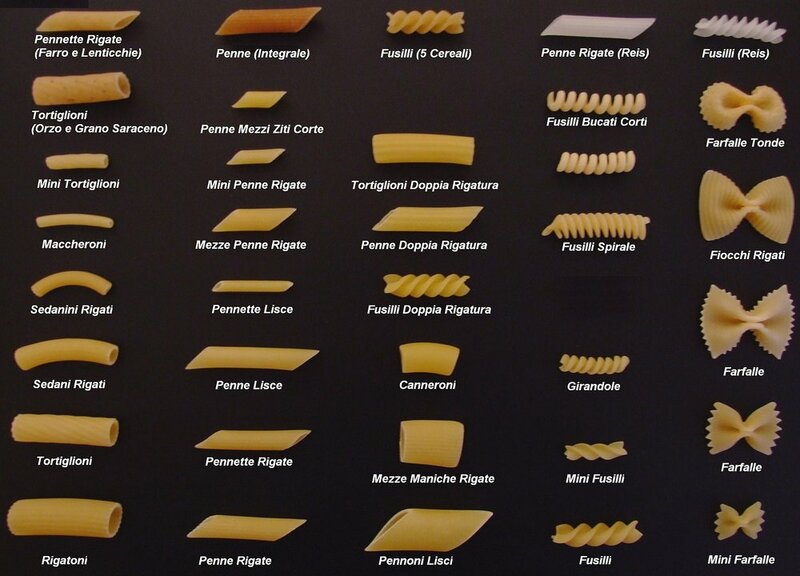 It comes in so many shapes, sizes and colors, from the common linguine to the more advanced tortellini. In this article we will cover some of them, what they are and what it is good for. As mentioned the recipe for the pasta dough is pretty easy and may actually be made with just flour and water, but is often made with eggs for a better quality and taste. Have a look at our recipe here. Pasta is known in all of the world, and most of us relates it to the Italian cuisine, maybe because we all have seen Lady and the Vagabond by disney, but both Arabs and and Asians claims that they actually were the first ones to make it. The first recipe of the creation of pasta dates back about 1000 years ago to the book, De arte Coquinaria per vermicelli e macaroni siciliani (art of Sicilian cooking), by Martino Corno. A couple of hundred years later, it were described by the geographer, al-Idrisi that Italians were making a pasta cut in to strings in a small region called Linguria, hence the name linguine, which has fathered several different types of pasta. Then in the 17th century in Naples, Italy, the mass production began, making pasta food for the working class because of the reduced production cost. Back then you would find several pasta makers on a bench, mixing the dough with their feet in huge portions. But the king of Naples did not like this, so he ordered the creation of the first pasta machine, and then the first pasta factory opened in 1763. Short pasta is characterized, like the name, by being short. This is pasta like Cellentani, Rigatoni or Pipe Rigate. These types of pasta are often used for dishes with sauces and soups. The Pipe Rigate, more commonly referred to as Macaroni, is well known from macaroni and cheese. In this dish it is used for it’s ability to soak in the delicious bechamel sauce. As you might imagine, this one is characterized be being long. This is for example Spaghetti, Canneloni and Bucatini. Because of it’s thickness, this is more often used as fill for a great dish, like Spaghetti Bolognese, where you are more likely to want a taste of the delicious sauce tomat than the pasta. It may of cause be used in the same way as the short ones, as long pastas like Canneloni, that can be filled with bologne sauce and baked in the oven with cheese gratin. That brings us to the next type. These are known as Tortellini and Ravioli. This is pretty straight forward as it is pasta dough with fillings. The filling may be whatever you like, but the classics are cheese and minced meat. The difference between these to are something as simple as the way they look. Tortellini is the folded round version and the Ravioli is the square-formed one, that is not folded. Luckily the Nordic Chefs were able to attend this year’s great show. It was a wonderful evening filled with stars, great chefs and some delicious food. A resumé of the stars awarded. NOMA, Copenhagen, got their 2 stars back after being closed for a period of time, due to moving to a new location. Gastrologik, Stockholm, Sweden, too got their 2nd star. And finally, KOKS, Faroe Islands, with chef Poul Andrias Zisca got their 2nd too, Poul was also rewarded with the title as “Michelin Nordic Guide Young Chef 2019” for his passion, creativity and technically capabilities.